Home / local news / ROP / 48 hours in the clink for speeding, Omani bagpipes and dead bodies. 48 hours in the clink for speeding, Omani bagpipes and dead bodies. I was reading the Muscat Daily yesterday and was rather interested in an article on Page 3 i think it was. Here is the link to the online version of the story. In the story, a Major Zaid al Hosni announced that drivers caught violating speed limits monitored by radar face 48 hours in prison and a penalty of RO 50. The article then goes on to state that between January and May 2011, 799,975 tickets had been issued to speeding motorists (an average of 159,995 a month). Assuming that each fine is RO 10 (and some are not, they range between 10 and 50) that is RO 8,000,000 in speeding fines revenue (a little factoid the Daily didnt publish!). The article goes on to state that in 2009 the total number of fines issued was 1,778,614 (an average of 148,218 a month) and that speeding fines are up. Well, given that the ROP are now using the sneaky cameras on the 18th Nov Street and Muscat Expressway, and that there are generally more people driving now than in 2009 (increase in driving age population), and that a new Fast and the Furious movie came out, I think that the increase in fines given is actually less per 1000 drivers than it was in 2009. I might be wrong, I can't be bothered to figure it out. Now it's confusing, because the article does not indicate whether all speeding offenders will do a tour of the Bowsher police station, or only those going really fast. Anyway, you might want to check this handy ROP website before going in to renew your Mulkia - it's an online speeding fine check (and payment) thing. If anyone can clarify the situation, please do share with the rest of us. Next up, also on the news. Today's Muscat Daily had a rather macabre picture of a dead guy that had hung himself on a construction site in Wadi Kabir. Really? Do we need to see the guy's dead body hanging like that? Next up, we could have an enterprising marketing company placing adverts on the dead guy. I wont publish the picture here because I think it was poor taste from the journo. But thats just me. Poor guy, I hope it was quick. But my question is.... are bagpipes something of a tradition here in Oman? How on earth did they get here, and when?! I was under the impression that bagpipes originated from the Gulf, and made their way north during the Crusades where they were used by Muslim soldiers as an instrument of war. Having caught the eye of European soldiers all that time ago the modern day bagpipe is very much Scottish, but the original instrument was a goat carcass with an external pipe inserted into the animal's windpipe, with the goat being held under the musician's arm in a similar way to the Scottish Highland Bagpipe and air pumped in accordingly. There is a strong belief in Oman that the origin of the instrument is from the part of the Gulf now known as Oman. Can anyone shed light on this or otherwise? I am no expert but the photo of the guy hanging does not look right. Firstly his legs are vertical which is not how a body hangs,and it appears that his feet are on a ledge. In addition his head should not be in line with his spine. Could this be a fake??? - As I understand it the "news" part of this news on traffic offences, is that there is to be a mandatory two days in jail for anyone speeding by 75kmh over the limit, plus the fine. - Bagpipes may have evolved independently in more than one place, but an origin in Arabia is possible even though the instrument is not particularly popular. They are found in Yemen and North Africa too. The Arabic word is "Qirub". But the ones we see in Oman have come from the British via military music - Scottish pipes to be precise, rather than the smaller Irish or Welsh versions. Bagpipes are probably the most popular instrument for local dances in Dhofar. 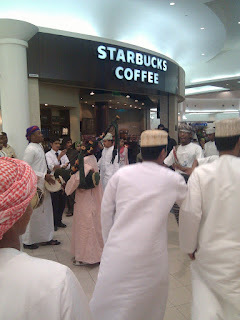 I rarely see them in Muscat (unless with the royal band) but we have bagpipes at most of our weddings, etc, here in Salalah. Bagpipes originated in Egypt I believe. Not totally sure how they migrated to Scotland and became so very popular but there you go!! Perhaps it was a coincidental invention of the same instrument in two different areas of the world - after all everywhere has drums of some sort. And bagpipes were traditionally made from animal stomachs and reeds so the materials are readily available. The piper in the photo looks like he's wearing a Royal Guard dishdasha - I can't be certain. Almost certainly RG or RAO anyway. The RAO have an excellent, indeed world class, 'pipes and drums' section, who sometimes play at the Edinburgh Tatoo and often do very well - far better than many of the local crowd. If you want to see them close up get yourself a ticket to the next Thin Red Line ball. Feet are firmly on the ledge. Body is leaning against the edge of the plinth. A dead body does not have muscular composition and the feet "droop". Muscat Daily should be, pardon the pun, strung up for this! Most Celtic music originated in Pagan Arabia so the Omanis do have a traditional version of the bagpipes (but not the same as the one you have pictured). Okay, I was finally not totally lazy and got out my book "Traditional Omani Instruments" published by the Oman Centre for Traditional Music in 2004 and looked up the Omani bagpipe: "The habban consists of a bag made from sheepskin or goatskin which permits a quanitity of air to be stored inside- and a chanter consisting of two pipes tied together each with a single reed and six aperatures. The double pipe allows the the sound of the habban to be amplified considerably. The habban originated in pre-Islamic Arabic and was popular in Gaul, Yemen, and Oman." -Pretty decent book if you want an intro to Omani traditional instruments with good pictures. I agree with Jet Driver, the photo does not look genuine, it looks like the guy is standing on plank. And if it is genuine, then they really need to think twice about printing such graphic images because, hey guess what! Kids can read and these newspapers are often just left lying around the house! Ugh.